Augmented reality, or AR, may finally be coming of age. Particularly for Millennials, defined as those born in the 1980s and whose lives revolve around being constantly connected to technology (Blackberries, iPhones, Facebook, Twitter, video games, and more), AR offers a serious opportunity for marketers to reach these important consumers. Augmented reality allows consumers and fans to engage with a brand, product or event, and lets them curate their own experiences. Not to be confused with virtual reality, augmented reality (AR) is a technology that layers computer-generated enhancements over an existing reality (a user’s real-world view), providing an illusion effect, accessible using a smartphone. 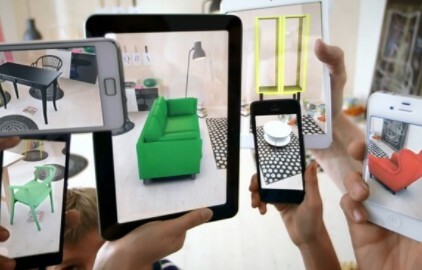 With augmented reality, marketers can take the physical world and combine it with the digital world, giving both users and brands the ability to connect even further with a product before, during and after making a purchase. As smartphones continue to proliferate our daily lives, offering these experiences in a mobile setting becomes increasingly important. And in the future, it will likely be the main way to reach consumers via augmented reality. It's important to think about augmented reality as an additional form of advertising (in other words, it shouldn't be your only strategy). But based on its newness, if you're able to pull it off correctly, your company is seen as innovative. Beyond that, the expense of pulling off an AR campaign pales in comparison to traditional print or broadcast advertising and establishes a longer-lasting, deeper connection with your consumers via an emotional connection, which in the end turns to more repeat business and sales. Here are the real reasons to think hard about utilizing an AR campaign. Innovation: It's always good to be first to market, particularly when it comes to technology. What added value does AR offer for businesses? You are connecting further with customers and you're seeing your content as a brand in the real world with unbelievable visibility and scale. Inexpensive: Print advertising in magazines tends to be significantly more expensive than online or digital ads. When creating an AR campaign, you often have more brand interactivity than the one-page ad at a significantly lower cost. Emotional Connection: AR takes marketing strategies to a more immediate and sensory level with customers, allowing greater interactivity in the selling and buying process. AR can create an emotional connection between what the buyer is searching for and what the product can offer. In short, it gives the product a personal feel when consumers can picture it in their own world. What really matters to us is the ability to take photos with virtual characters, products and environments, which is where it will resonate most and develop that deep brand connection. Repeat Engagement: For most brands, engaging customers must come before, during and after you've created a dialogue with them, and with AR, brands engage with consumers, both cognitively and through their senses. For Millennials, it is rather simple: if the messaging and the experience are not engaging, and do not create brand desire, then customers may just move on to a competitor. Companies simply cannot afford that when you consider the Customer Lifetime Value (CLV) of Millennials, who have upwards of 60 years in their buying future. Geo-Targeting: With AR, not only can you determine what people's buying patterns are like via pre-existing data, but you can utilize GPS data (from smartphones, namely) to immerse users in a brand experience no matter where they are in the world. For a brand like Stella Artois, their augmented reality iPhone app Le Bar instantly locks onto your location and lets you find a local bar serving the popular Belgian beer by populating your smartphone with directional arrows pointing you to the nearest Stella taps. Hyper-local advertising will continue to be an important strategy for marketers, as spending money to reach the right customers (or what your brand perceives as the right customer) is debatably worth more than overspending on a large-scale, national campaign that may or may not hit your intended demographic. Driving Offline Sales: At the end of the day, it comes down to ROI on any campaign. The key to developing successful AR campaigns that provide customer engagement as well as translate to sales will be ensuring that they support the local communities they're used in while creating unforgettable experiences for the customers using them. In many ways, AR brings offline experiences to online sales by enhancing the experience and driving brand visibility. Realestateuno is a working on an (AR) platform to allow retailers and consumers to come together in new ways. If you are interested in finding out more please contact us.